Y’know, disco music sometimes gets a bad rap (heck, there was a whole stadium event where hundreds of kids destroyed disco records in a huge bonfire and then basically started rioting over how much they hated the genre) but we gotta be honest: We’re big fans! Hear us out: There’s nothing like a four-on-the-floor drum beat and syncopated electric bass line to get you off your seat and on the floor, ya dig? And those symphonic components…? String sections, flutes, horns, and electric piano, sometimes all in one song?! That stuff is LUSH! Also, you can’t beat a great back story, and a lotta disco songs got ‘em. “Disco Inferno” by The Trammps - often cited as the first “official” disco song (there’s earlier stuff by The Supremes, Stevie Wonder, and The Jackson 5 that sound like disco, but disco purists often argue that “Disco Inferno” was the first song that had all the technical and classic elements of a disco song) - was inspired by a scene in the 1974 blockbuster film The Towering Inferno in which a discotheque is caught in the blaze. Le Freak (Freak Out) by Chic was written after the members of Chic were denied entry at Club 54 (the pinnacle nightclub during the disco era). To vent their frustration, they began riffing on a song whose original chorus of the song was “Ahhhh, __ Off!”, which then eventually became “Freak Out”. And while disco may have died, just before it cashed it out, it gave birth to a new and enduring genre of music with the very first hip hop song, “Rapper’s Delight” by Sugar Hill Gang (hint: Listen to the song’s lyrics to find out why the genre became known as “hip hop”). So anyway! 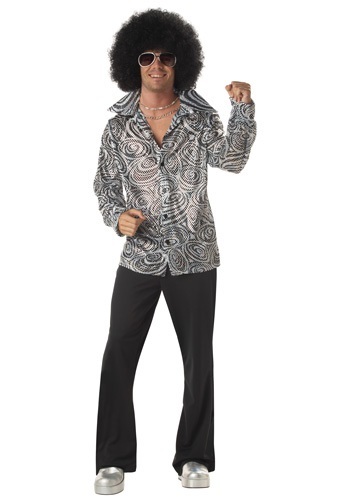 You should get this Mens Disco Shirt. It's got a classic 70s wide collar and front buttons, and it even comes with a black curly wig for an extra sweet '70s touch. Pair the shirt with some swingin' bell bottomed slacks and platform shoes, and you'll be ready Le Freak your way to a good time!